If you’re looking for a beautiful wilderness to escape to, Maine will give you plenty of opportunity. 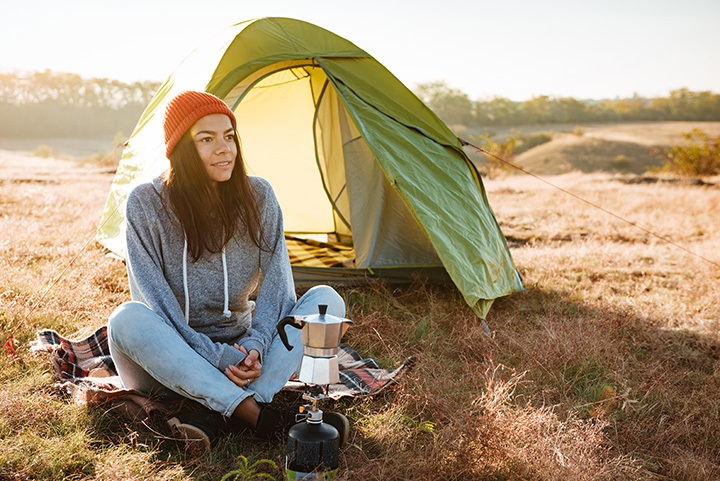 Whether you enjoy being lulled to sleep by the ocean waves along the rocky coast or the solitude of the northern pine forests, Maine has a wide selection of camping spots throughout the state. From Cape Neddick all the way to Presque Isle, you’ll find the best camping spots in Maine. A lobster pound across from a campground, what more could you ask for? Situated on Shore Road between York and Ogunquit beaches, the Cape Neddick Oceanside Campground offers tent camper or tent spots right on the ocean. You can wake up to the salty air and views of the ocean from your tent. Hemlock Grove Campground in Kennebunk offers “a northern Maine atmosphere with southern Maine convenience.” Large campsites for everything from small tents to large RVs are surrounded by tall pines and quiet solitude, but near four popular beaches. Operating since 1970, Bayleys Camping Resort is one of southern Maine’s finest by the sea. The campground offers three heated pools, four hot tubs, a game room, playgrounds, and much more for the whole family. Camp sites vary in size and even have Wi-Fi. Located on 626 acres of pastureland with over four miles of Oceanside frontage on Casco Bay, the Recompense Shore Campground is a great place to discover the best of Casco Bay. There are over 130 oceanfront, forest, and field campsites. If camping isn’t for you, there are three rustic camping cottages as well. Hermit Island Campground is a family-oriented campground located on a 255-acre peninsula at the southern tip of Phippsburg. The 270 campsites are scattered across the peninsula near sandy beaches, rocky cliffs, and the wooded interior. The campground is just a hop, skip, and a jump from Popham Beach State Park and the Kennebec River. Lake Pemaquid Campground is situated near the ocean on Lake Pemaquid. The 200 campsites welcome RVs, trailers, and tents. The campground offers everything you need in a campground from a sandy beach to swimming pool to regularly scheduled events and entertainment. Imagine walking directly outside your tent to the hiking trails. Camden State Park is home to Mount Battie, Mount Megunticook, and Bald Rock Mountain. The campground has 100 campsites complete with hot showers. Acadia National Park is the oldest national park east of the Mississippi. Stay in the heart of the park at Somes Sound View Campground. The campground has more than 50 sites for tents, campers, and RVs. Enjoy the heated saltwater pool or rent a canoe or kayak and discover the beauty of the old granite quarry. Sebago Lake State Park is one of the largest campgrounds in southern Maine with over 200 campsites. While most sites need to be reserved prior to the season, there are some areas that don’t require one. Enjoy the beauty and fun of Maine’s deepest lake. Cobscook Bay State Park is one of Maine’s most unique parks featuring 888-acres of wildlife and beauty. Surrounded by the ocean, the tidal range averages over 24 feet. The park offers 106 campsites for tenting and RVs. Cobscook Bay is perfect for bird lovers. Established in 1938, Chimney Pond is one of Maine’s most popular backpacking campgrounds. The campground offers nine lean-tos and a 10-person bunkhouse. The campground isn’t for the faint of heart as it requires a 3.3-mile hike form Roaring Brook. Aroostook State Park is Maine’s first state park opening in 1938. The 800-acre state park has a variety of campsites for tents to RVs. The trail to Quaggy Jo Mountain’s South Peak is located in the park along with great swimming, boating, and fishing. The Moosehead Lake Region is one of Maine’s most beautiful and peaceful spots. If you’re a fan of watersports, Lily Bay State Park offers the best access to the water. At over 8,000-acres, Mt. Blue State Park is Maine’s largest state park. The park offers incredible hiking, biking, swimming, and camping. The campground has 136 wooded campsites located just a short walk from the sandy beach of Webb Lake. The Allagash Waterway in northern Maine is one of the most remote areas in Maine. Located in T3-R12 (yes, that’s the town name), Allagash Gateway Campground & Cabins is situated on the beautiful shores of Ripogenus Lake. The campground offers a wide range of campsites for tents and RVs, and cabins. If you’re looking for remote, this is the place for you.